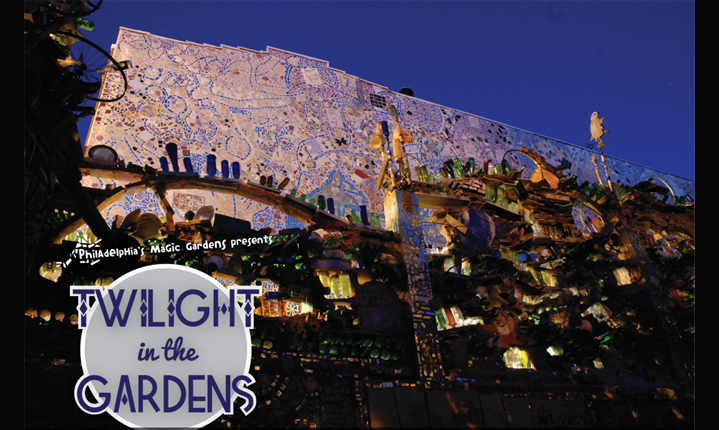 Come to Philadelphia’s Magic Gardens on Friday, October 24th from 7:00 PM to 10:00 PM to celebrate the Mexican holiday of Day of the Dead in a non-traditional, yet fun manner. At October Twilight in the Gardens you can enjoy art, ethereal music, and the exploration of both light and shadows at this unique, not-to-be-missed, event. The music that will be playing was created by artist Ben Warfield that uses his daily photobiology studies as inspiration to make the hypnotic sounds in his free time. Projections will be displayed that were created by gifted visual artist Joey Evey. Together this will create a beautiful light and sound pairing for your senses. Wander the gardens and enjoy the sights, or partake in other planned activities like making Day of the Dead inspired paper shadow puppets with artist Katharyn Colema and taking a 20 minute guided tour which lets guests get a rare glimpse the mosaic-filled basement. Click here to learn more about the artists and the event. This happening is BYOBB, so bring your own booze and blanket, but be sure to drink responsibly. Further there will be wine available for purchase. Philadelphia’s Magic Gardens is located at 1020 South Street, Philadelphia, PA 19147. For more information, call them directly at (215) 733-0390.